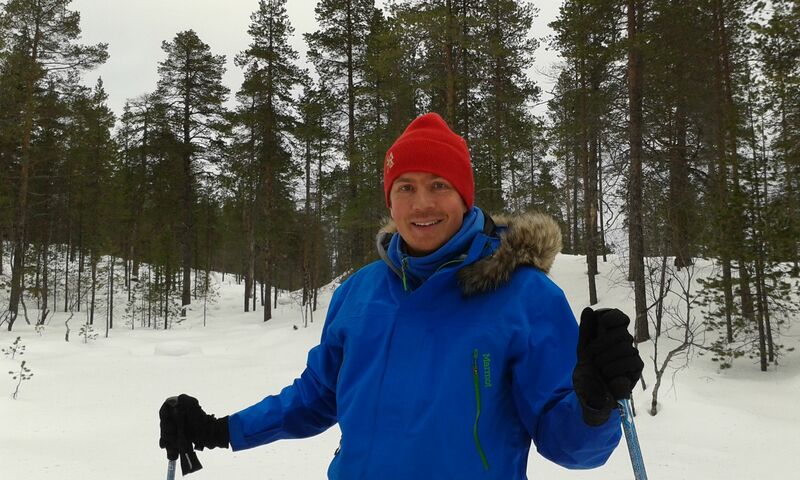 For me last winter weekend in Lapland this spring we headed to Riisitunturi National Park. It is one of the most popular National Parks in Lapland because of easy access and beautiful nature. There were a lot of people around during the day, but we were the only ones staying overnight in the open hut. The weather was nice and warm, but cloudy. So not the best conditions for photography. There is a crosscountry ski track to the hut. It is just 2 kilometres and it is also easy to reach with snowshoes. We skied to the hut, but we also took our snowshoes with us. After a short break we did a short tour with the snowshoes around the park. The trees were all covered in snow and it was really beautiful although the sun wasn’t shining. We spent the evening at the hut and you could see the lights of Ruka Ski Resort very clearly. It was still cloudy and very soon after this picture it began to snow. The next morning we headed back to our car and the weather was still cloudy and grey. But I certainly recommend the place as an easy option for your first winter adventures. And it is an amazing place for photography. I really want to get back there when the sky is clear and try to capture some Northern Lights.